Learn about Salesforce.com report features and functionality in this chapter from Salesforce.com for Dummies. Discover Salesforce.com's report features and functionality in this chapter. Learn how to customize reports and search within reports using advanced drill down, break out and filtering options. This chapter covers all of the advanced features and functionality in the Salesforce.com reporting tool. 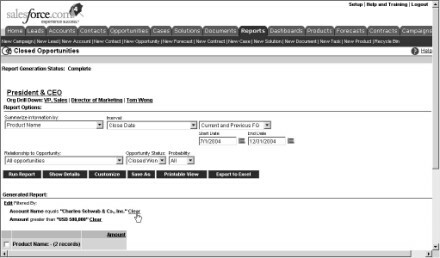 A fast and easy way to generate reports is to customize from an existing report. For example, if you like the standard Pipeline Report but you want to modify the columns, you can simplify work from the existing report. Reprinted with permission from Wiley Publishing Inc. This excerpt from Salesforce.com for Dummies is written by Thomas Wong and published by Wiley Publishing Inc.
1. Click a link for an existing report. 2. Click the Customize button. A page from the report wizard appears. 3. Based on what you want to customize, select a step from the Jump to Step drop-down list. The wizard page appears based on what you selected. 4. Modify the fields within that step to customize your report. 5. Continue jumping to steps until you're satisfied, and then click the Run Report button. The report appears modified based on your settings from the wizard. 6. When you're done, click Save or Save As. The Save button replaces the prior report. The Save As button saves a new one. In either case, a page appears to save the report. 7. Complete the fields and click Save. The Reports home page appears. 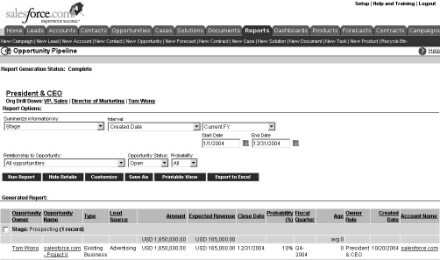 Over time, you'll develop core reports that have the columns that you want in a format that makes sense to you. One of the huge benefits of reporting in salesforce.com is that you can use existing reports on the fly and apply report options to limit or reorder the report results. For example, with the standard Pipeline Report, you might want to sort by Opportunity Owner instead of Stage; look at only one region; or look at three quarters instead of one. All those options and more are possible in seconds without having to use the Customize button. In this section, I show you how to filter your reports with tools that include the Org Drill Down feature, the Report Options section, and enhanced drill down and break out options. In Enterprise, Professional, and Team Editions of salesforce.com, many reports display an Org Drill Down feature that you can use to view information by users, roles, or the entire organization. 1. Click a report in the Activity Reports or Opportunity and Forecast Reports folders. For all but three to four reports, the report appears with a set of Org Drill Down links, as shown in the example in Figure 15-7. The titles of your links vary based on the role hierarchy set by your administrator. If you don't see the Org Drill Down feature, you might still see a drop-down list under the Report Options section that allows you to report on your teams. For example, on the Reports home page, click the Opportunity History Report link under the Opportunity and Forecast Reports folder. The report appears, and under the Report Options section, use the Relationship to Opportunity drop-down list to filter data on your teams (as defined by role hierarchy or sales teams). See Chapter 9 for further details on setting up sales teams. 2. Click a link to the right of the Org Drill Down title. 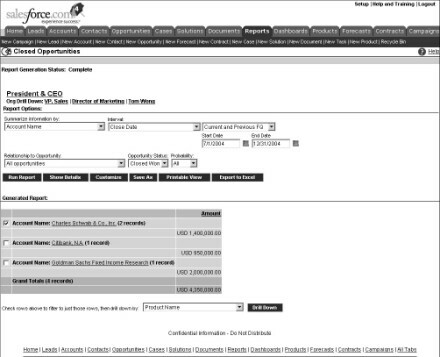 The report reappears based on your selection, and the links above the Org Drill Down title display your current view. Notice that the links to the right of the Org Drill Down title might provide you other choices to drill down further into your team. 3. Repeat the Step 2 as often as needed until you get your desired view. Notice that you haven't changed the underlying report but just limited the view. If you don't see the information you expect to as you click through the Org Drill Down feature, consult your administrator. Nine out of ten times, the problem might just be that the role hierarchy is set up incorrectly or you're assigned to the wrong role. When you open a report, it appears with a variety of filters in the Report Options section at the top of the page. By using the filters in the Report Options section, you can look at your data from multiple angles based on your needs. The available standard filters depend on the type of report that you selected. For example, click the Lead Status link under the Lead Reports folder. The Lead Status report appears. Look over the Report Options section, and then click the Back button on your browser. Next click the Sales by Rep link under the Sales Reports folder. Notice that the standard filters in the Report Options section differ based on the type of report. From the Summarize Information By drop-down list, select a field. For example, if you want to look at your opportunities by rep, select Opportunity Owner. From the Interval drop-down list, first select a date field, and then in the drop-down list to the right select a standard interval or create a custom range. For example, if you want to look at all opportunities created in 2004 to the present, you would first select Created Date, and then define the interval, as shown in Figure 15-8. From the Relationship to Opportunity drop-down list, select the scope. Use the Opportunity Status drop-down list if you want open and/or closed records. Use the Probability drop-down list if you want to limit the results by probability. At any particular time, click the Run Report button to apply your selected filters. The report reappears based on the filters you defined. To see a collapsed or expanded view of your report data, use the Hide/Show Details button in the Report Options section. For example, from the Reports home page, click the Sales by Account report under Sales Reports. When the report appears, click the Hide Details button. The report reappears in a collapsed view, and the Hide Details button has morphed into the Show Details button. Now click the Show Details button, and the report expands again. By using Hide Details, you can easily view headings, subtotals, and totals. Reports in salesforce.com now have a drill down function that you can use to select rows within a report and instantly break them down by a different field. For example, if you're reviewing an Opportunity by Rep report, you might want to select a specific rep and then sort the rep's opportunities by stage. With enhanced drill down and break out options, you can do this in just a few quick clicks. 1. From the Reports home page, click the Sales by Rep link under the Sales Reports folder. 2. In the left column of the Generated Report section, select check boxes for records you want to view. If you don't see check boxes and you know you've closed opportunities in salesforce.com, select an interval in the Report Options section to see all your historical opportunities and click Run Report to view more records. 3. At the bottom of the page, select a field from the Drill Down By dropdown list to summarize the information, if desired, and then click the Drill Down button, as shown in Figure 15-9. The report reappears based on your selections. For example, if you chose the Close Month option from the Drill Down By drop-down list, your selected opportunities would be sorted by close month. 4. If you want to use the report in the future, click Save or Save As. If you have reports with advanced filters, you can easily view and clear the filter to expand the results. For example, if you created and saved the test report in the preceding section, you might want to clear the filter on the selected rep(s) to see all closed opportunities by close month for all reps. The advanced filters, if any, appear just below the Generated Report header on a report page. 1. Click the link for a report that you've applied filters to. The report appears, and your criteria filters are listed under the Filtered By header directly below the Generated Report header. 2. Right below the Filtered By header, click the Clear link to remove a filter, as shown in Figure 15-10. The report reappears displaying a potentially wider universe of data. 3. Be sure to click the Save or Save As buttons if you want to save this report. You can quickly modify advanced filters by clicking the Edit link next to the Filtered By header. The Select Criteria page of the report wizard appears.